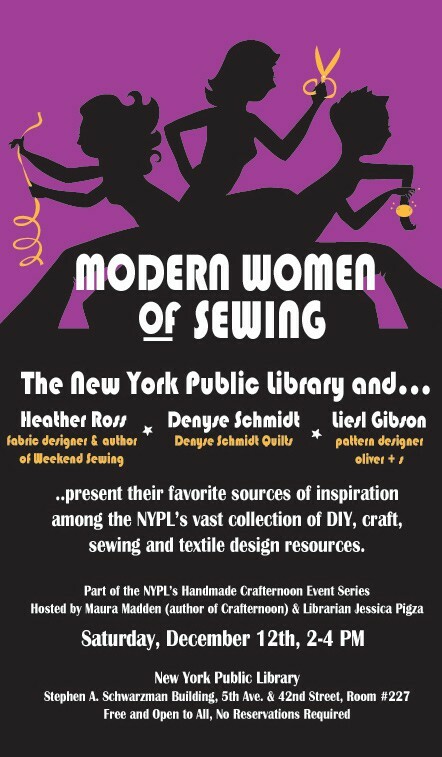 With tongue placed firmly in cheek, here’s the flier (designed by Heather Ross) for next month’s Modern Women of Sewing event at the New York Public Library. We hope to see you there. Bonus points will be awarded to anyone sporting feathered hair or a jump suit. I think my head just exploded with excitement! Fortunately I'll be back in the country by then! Still can't see it – odd. All of your other images load fine and are in their places. I'll try it again on Firefox versus IE. Made a change to the image file. It seems to work fine now. Great poster (I love that the hair is correct)! Did the NYPL graphics team do that? Isn't the hair funny? It's easy to tell who is who. This is all Heather's work–talented woman that she is! I can't get enough of that poster. It is the BEST. Wish I had one just to hang in my sewing space. What a hoot. ohhhh… now I really wish that I lived in NYC!